This article submitted by Lynne Jacobson on 9/1/98. The summer weather has been gorgeous the past few weeks and one of the things people like to do in such nice weather is eat outside. Lately though, as soon as you sit down with food or drink, the yellow jackets and hornets arrive too. If you have a lot of flowers in your garden, you’re likely to see bumblebees. They are attracted to both the nectar and pollen. Don’t be alarmed if you see them buzzing around your flowers, they rarely sting then, as they are more interested in the food supply. The reason wasps become such a problem in late summer is they do not store food (honey) like bees and so need to forage daily in order to meet the dietary requirements of the colony. In the fall, their eating habits change. This year, because of the early spring, their taste switched earlier. The workers normally collect protein, such as flies and take them back to feed the larvae in the nest. The larvae secrete a carbohydrate which the workers eat. In late August, the queen stops producing larvae and the workers start looking for sugar outside the nest. It is usually at this time that wasps are of the greatest nuisance, when their numbers are at their peak and they are searching for sugary food. To manage wasps at picnics and around food concessions, hang some food over a gallon container of soapy water. When these insects leave the hanging food, they sometimes drop down a short distance before beginning to fly, dropping into the water. If you have a nest, the best solution is to wait until it is abandoned in the fall. Nests can be safely removed in the winter. Wasps use their nest for only one season. If the nest is in an area causing problems, it can be destroyed with insecticide. 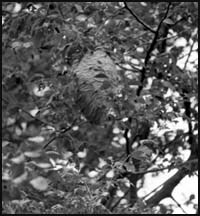 Applications are best made during the late evening or during very cool periods in early morning, when the wasps do not readily fly. If you do get stung, “the swelling and itching are caused by an allergic reaction and will diminish in several days,” said Saturday’s article in the StarTribune. The best thing to do is to apply cool water or ice wrapped in a cloth.